1) What is your favourite beer/wine/fizzy drink? 2) What toothpaste do you use? 3) How do you choose what films to watch? 4) If you could eat out tonight (at your own expense) where would you go? 5) What does the price of a book tell you? Got the answers? Good, because today I want to talk about authors as brands. Not about your ‘social media strategy’ or how you wear your hair at book signings. No, I want to talk about what messages you want to send out about your work to people who might want to buy it. I’m neither a publisher nor a book marketeer, but I do know something about brand management. Once upon a time I used to do it for a living. What brands have in common is that they aim to stand out in some way. We call it product differentiation: They make your clothes softer, your shave closer, provide greater protection for your baby’s delicate bottom cheeks against the evil of poo. They bring health to your teeth and the appearance of health to your hair. It takes fewer sheets to wipe up a spill, or indeed to, well, wipe. In this way you are better served by the products, your life is made more comfortable or pleasurable in some way. This does not just happen because the TV commercial tells you so, but because a lot of clever people have been working hard for a long time in order to try and make it that way. It is product differentiation that leads you to be able to answer questions 1-4 above with anything other than “I don’t care, whatever is cheapest.” Did any of you say that, by the way? Delivering product differentiation comes at a cost, of course. Cost of materials, research, packaging design, advertising and marketing costs, paying the sales people who ensure it’s available to buy wherever you shop, etc. etc. Which is why you’ll not find these products at, say…99 cents. In the world of publishing, how do books differentiate themselves? You tell me. What’s clear is that differentiation is an evolving strategy. It’s a busy market, competition is fierce. You have to keep improving, keep innovating, keep surprising and delighting the people who buy what you have to sell. This is a GOOD THING. And in that way you have the right to sell your product – your books – and for a decent price, in a world where choice has gone crazy. I’m interested by choice. In developed economies it overwhelms us at every turn. People think they like choice, but in reality they don’t, not so much. Choice is complicated. Packed supermarket shelves are stressful and time consuming. Shopping where you have the choice between apples, oranges and peaches is far less stressful than a choice of a hundred different fruits. And when consumers are faced with a choice where they don’t have the information – or time – to decide, they tend to use price as a measure of quality. Very low price = utter rubbish. Does not work, falls to bits. Low price = low quality. The thing works. Often sells in bulk. Mid price range = mid quality. Mass market. Nice. Towards the bottom end of this range are cheap brands, towards the top end are pricier ones. High Price = high quality. It’s durable, or niche, luxurious or has a monopoly on the market. Very high price = status symbol. So what did you answer to question number 5? What does the price of a book tell you about the book and/or the author? As with any market, I think it’s clear that there is room for a broad spectrum of prices. OK, I took a pop at 99 cent novels earlier, but I imagine there are many people who simply can’t afford full price books. A 99c e-book could be an affordable way to satisfy a thirst for reading. I would like here to mention libraries, but fear that is for a different post. I will mention J.A. Konrath, though. He sells his ebooks at $2.99 (about 2€), which he has identified as the sweet spot between low pricing and high volume of sales. He’s a smart guy – that strategy is really working for him. However he recommends that all authors self-publish and keep pricing below $3.00 for e-books. He acknowledges that not every self-published author will earn the revenues he does, but that if you choose any other way to take your brand to market you are effectively losing money. Is he, in effect, advocating the collapse of differentiated pricing for books? Or that some authors should sell their novels at 50 cents a pop? There is (usually) a massive amount of effort goes into writing a book. Effort and time. How much time? What is it worth to you? Would you say you put in a year’s work? Half a year? And on top of that are there costs such as editing, copy editing, cover design, sales effort, marketing effort… how can that all be represented in such a diminutive price tag? The other problem that I have with Konrath’s model is the assumption that there is a market out there for most unpublished authors to make an average writer’s income. So the pie, in terms of money, is not actually getting bigger. Which means thousands more authors get a little slice of the pie, but there’s only the same amount of pie to go round. So in the end we all earn less for our efforts. One last word about *promotions*. There’s a big difference between pitching your books at a permanently low price, and running price promotions. A promotion can do a number of things: Get people to try you out, boost your sales (a lot in the short run, a little in the long run), tactically swamp the market with your product in order to push out competition…99 cent promotions – go wild! Use them wisely, reap the rewards. But I still feel strongly that a permanently low price for high quality writing sends out all the wrong messages. I have been wracking my brains trying to find an example of a successful product or service launch – in any market – that chose the strategy of a permanently low price point for a high quality product. So far I am really struggling. Can anyone help me out? *£12.99 is the RRP of The Night Rainbow in hardback. I hope, when the time comes, you’ll consider that it’s worth it. There is a uniqueness to each book that means you can’t simply substitute one for another in the way you can grocery items. I do take your point though about the problems that generally pricing of books too low could bring. I will often wait for a paperback to come out of a book I really want, or – if its an author I don’t know of the e-book is cheaper, I will wait to get it on my Kindle. None of us have money to buy everything we want! But I’d only expect to pay rock bottom prices, even electronically, for a good book as some kind of promotion. I agree to a large extent with what Sherri says above, but I would add that, especially in this recession, if I find a book I want, whether it’s one I’ve been keenly awaiting or a ‘find’ on the shelves, and it’s expensive then I am very much influenced by how thick/how quickly I would read what I’m getting. A thin page-turner I’d enjoy once will be looked for in charity shops or the library. A thicker, more substantial read, or one I’d linger over and probably re-read is more likely to be bought or at least put on my Christmas/birthday wishlist. It may have taken the author and associated team just as long, but I suppose I’m paying for the length of a pleasurable experience and not just the satisfaction and enjoyment itself. Ideally, I’d be paying full whack for books by every author I enjoy, and supporting fellow writers and the publishing industry in every way I can. I still do where I can, but realistically new books are now a luxury item, and as a family we make cutbacks where we can. Best of luck with The Night Rainbow, by the way! I love my Christmas/Birthday wishlist. Usually the fruits of that see me through the year (will a few impulse buys along the way). I agree we buy books in many different ways, and I think that often reading books in a library, borrowing from a friend or getting a good deal on an ebook from a back list is a great way to meet new authors. You raise an interesting point about the size of the book, I hadn’t thought about that! Thanks for the good luck! In practice hardly any of the hardbacks will retail at £12.99 I’m sure. Buying direct from Bloomsbury already takes it down to £9.74 (no retailer margin) and it seems Amazon thwack the price down from day one. But it’s a sort of value ‘flag’ that I think is worth waving. £12.99 is fine but I’d like it signed, please! I’d agree with you for most products but artistic quality is subjective and price=quality wasn’t always true for authors in the past either. Today price=quality is holed further by disruptive technology upsetting the traditional sales channels but the new production and pricing models to replace them haven’t developed fully. I recently bought Isabel Ashdown’s Hurry Up & Wait on Kindle for £0.99 (It’s been £1.49 since) based on a short sample but primarily price and I really enjoyed it. It’s £5.87 on Amazon as a paperback (which is pretty much full price for Amazon) and retrospectively it was worth that but I’m not sure I would have paid £5.87 in the first place as I did’t know her as an author. So here’s two completely different pricing models for the same book! (market penetration and skimming to use the technical terms). Are these pricing strategies working for her and her publisher – I haven’t got a clue! Supermarkets aren’t pricing books to make a profit either unlike a bookstore which has to (sorry Sainsbury – book seller of the year – *gags*) so that distorts the popular market and makes people think that because the books they sell are £4, books over £4 are ‘overpriced’! I think the self published route and the e-book market are still finding their feet and an audience. Clearly self published authors haven’t been snapped up by a publisher and they need to attract readers. Price is one of the few tools they have in the absence of other marketing tools. We see this in business where sole consultants can’t charge the same rates as those charged by a Big 4 consultancy for the same work. I suspect lots of people will try self publishing, a few will succeed and many will have the satisfaction of being ‘published’ but not earn much money. Eventually the market will set new price points for different media and quality which will sustain a ‘professional’ market. The publisher adds the veneer of quality. To answer your specific question, I don’t think anyone with a business brain chooses to keep a permanently low price if they feel the market can stand a higher one due to perceived high quality. I could argue that Skoda is a very high quality product (VW engineering) but sets a permanently low(er) price point but we could argue that the history of the brand requires it. Unfortunately we won’t be able to argue because you have put a picture of a pie in the article and as a Lancastrian this has made me extremely hungry! It’s a Pukka pie, no less. Now I’m hungry too. On a more serious note, to my rusty marketing mind, e-books and promotions seem like a perfect way for people to ‘sample’ authors that they wouldn’t have otherwise bought, as in your case. I’m looking forward to seeing how this market develops because at the moment it’s quite the conundrum! You asked about quality products that are permanently cheap. The answer is really in those products that have been commoditised. So paperclips are a good example. They tend to be good quality and cheap but they are like electricity in that you generally do not care who made them. Historically I have been tempted by free chapters of books that allow you to try before buying, much as Amazon’s look inside feature does. I do not think that price will be a good indicator in the near future…Beyond the short term I make no predictions. Interesting points, thanks. I think that Sherri and Gill made the same point, and I feel the same way, that what counts most is do we want the book. So when the market is flooded with 0.99 – 2.99 books from unknown authors, how will we choose? I’m guessing that apart from the odd impulse purchase (low price=low risk) we’ll go the old fashioned way: do we, or someone we know/respect know and like the author? One of the big advantages of ebooks is that you can almost always download a free sample. Reading 20 or 30 pages is a great way to decide whether you like a new author – or whether there are quality issues – before you decide to spend any money. That applies equally whether you’re at the top or the bottom end of the price scale. I couldn’t agree more. The first chapter should hook a reader enough to persuade them to pay the appropriate price for the book. I just had a sudden thought… how about segmented pricing? Price sensitive people could get the books cheaper and less price senstive people could be opffered them for more? I guess that could work in grocers, but unlikely on Amazon? Or is there a way? or is that going a bit far – still, willing to give a try come launch week, just let me know! I think this argument applies more to eBooks than to physical books, and then more to an unknown author than to one you know and love already. If I want a physical book badly enough I’ll pay the going rate, even in a bookshop. Most bibliophiles will. Self-published books on Kindle are something else entirely – I love being able to try something out, but confess that if someone prices their own work at less than the market price for a paperback then I get the message that they don’t value their own efforts as much as a conventionally published & supported author’s. Sales are great, but if you don’t have belief in your words then I don’t have belief in them either and chances are I’m not even going to bother downloading a sample. Yes, because for physical books you can stand in a book shop and browse them. Or Amazon will let you read the first few pages. Interestingly, for the Dutch release of my novel there is a plan to publish the first chapter online. I think you must have utter confidence in your writing for that to happen, but as you say, how can you expect others to believe if you dont? Claire, like you I have some training in marketing (I whisper it softly these days that I have an MBA). There are many aspects of the publishing industry that would absolutely confound any business school teaching. The whole industry appears to be upside down. In your FMCG example (Proctor and Gamble?) then a very significant part of the company’s budget is invested in R&D. That’s because it’s understood that’s where the company’s future is going to lie — to create innovative produts (to use a bit of management speak). You hardly need to say any more. Or maybe also contrast publishing with sports like football. Of course, most boys/men would love to be a professional footballer and there’s no shortage of supply (as there is with writing) but the clubs still have a highly organised network of scouts and talent spotters. This doesn’t address the pricing point directly but it suggests that an industry that doesn’t invest in its R&D is vulnerable to being commoditised. Hi Mike – yes, what a pertinent point. And it seems in publishing that the weight of ‘R&D’ lies with the authors. A very well published friend of mine has recently been told by his publisher that a ‘proposal’ for his next novel is not enough: once he has written the boo they will consider it. So the author bears all the risk. Of course on the other hand, many of us writers don’t like being told what to write! Yes. The author does all the product development (with the exception of ghosted celebrities) not to mention all the training — all of us sinking money into creative writing courses and retreats and so on. It seems the current model is good in terms of number of books being published — as publishers are presented with a range of options to choose from and take a punt on a new writer every so often. But because they’ve not invested much in the R&D in the way that someone like Unilever or Apple might for a new product then that new product will often be largely let to sink or swim. It seems as if the marketing money (3 for 2 tables and so on) tends to follow those authors and titles that have achieved a breakthrough by other means (e.g. competitions, social media, word of mouth). 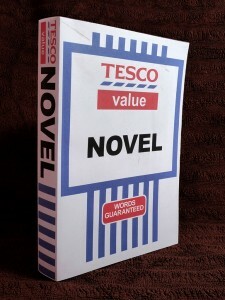 I’m not sure the FMCG alternative would be very attractive for most writers as it would lead to less books overall being published but the lucky authors whose novels made it to publication would be have a lot more resources devoted to them. I wonder if the publishing industry is heading for a sort of bifurcation with e-books creating a huge number of virtually self-published titles while the publishers make money by focusing on selling huge quantities of 3 for 10 top 100 paperbacks in Asda. This is exactly the debate we need, as authors, readers, consumers. I have conflicting feelings as a published writer – do I want loads of people to be able to buy my book cos its cheap – or should I be thinking of royalties and the quality end of the market? As a consumer, I’m buying many many more books since Amazon, partly because we do not have much choice of retailers where I live. Is more better? I buy most of my books by mail order too, since I live in France and read in English. I also love getting GOOD books at a knock down price. But by the same token I would rather read fewer books and pay full price than buy twice as much crap. I don’t think we can expect readers to turn their noses up at a bargain, who would? But a bargain is only good value if you get something worthwhile. I suspect (hope!) that in the end if we (the industry) hold our nerve and don’t let the price collapse, then there will be a natural settling at something sustainable. I do hope that’s not naïve! I’m afraid if someone puts a high price on a self-published book or one from a small indie (same thing)I assume it’s priced highly because they don’t expect to sell many and therefore it’s probably not that great. Great article. Enjoyed this VERY much. Coming late to this … Fascinating stuff (especially about choice – I hadn’t really understood that) and I realise that even in the 18 months since you blogged, Claire, the map has changed. The “digital noise” out there of – largely – self-publishing promotions, has got ever louder. It’s become clear to me that the people who self-publish to earn a decent living (the J A Konraths of this world) are, essentially, running a business. It’s a business which is publishing and selling like any other, except that what they’re selling they just happen to manufacture themselves: their books. Whereas those of us who want the heart of our living-earning activity to be the creative work, not the running of a business, will continue to look to agents and publishers to do what they’re good at – selling books – while we do what we’re good at: writing them as well as we’re humanly capable of. Which isn’t to say we shouldn’t be businesslike in thinking about what we can sell. Nor can we afford to ignore the possibilities that self-promotion offers. We can’t do much about the shift in perception that the supermarket cut-pricing offers, but we can value ourselves, not from diva-ish-ness, but because, frankly, if I didn’t think my writing was worth £5 or £10 of anyone’s money, I wouldn’t feel it was worth writing. And when I don’t think something’s worth writing, my writing-engines just don’t kick in. As you say, Claire, cut-price or no-price promotions, as part of the business of selling, are one thing. But what does giving a novel away for free, or 99p really say? I think it says that you don’t respect your readers enough to offer anything that’s actually worth having – and that you don’t respect yourself. Thanks for your comment, Emma. Yes, even in that short space of time it really does seem to have changed doesn’t it? The 99p/free novel strategy seems to have become an accepted model now, particularly for authors trying to break out. Unfortunately, whilst many see this as the only tactic open to them to get readers to try their work, I doubt that it is working as a business model – for most. And as the clamour gets louder in the book bargain business, the harder it is going to be to make yourself heard that way. I think a much better way to make a name for yourself, for example, is to get some short fiction out there, or if you don’t write short stories then a sample chapter – to impress readers and make them want more (that they are willing to pay for!). Claire, I read your excellent post and skimmed the comments. In one of your replies to a comment you said, “So when the market is flooded with 0.99 – 2.99 books from unknown authors, how will we choose? I’m guessing that apart from the odd impulse purchase (low price=low risk) we’ll go the old fashioned way: do we, or someone we know/respect know and like the author?” Exactly. This is the point and seems like the main point of your article, too. It is, as you say, about perception, brand, trust and trying to work with the emotional response of the customer. My emotional response to a cheap book, if I know nothing else about it, is this: it may well not be good, probably poorly and unprofessionally edited, and there are so very many other books with a higher value attached; since I (like most people) have very limited time and want my reading experiences to be very positive, why would risk my time by investing it in something I don’t trust? Thanks Nicola – yes, that’s exactly the crux of my argument, that we buy something because we trust where it came from, and if we have that trust then we will pay a reasonable price. I have been delighted to download free short story collections from writers that I rate, but to be honest, I would have paid for them. I have also a sad virtual pile of novels that I downloaded as free offers and won’t ever come back to, because unfortunately the reason they were free is that they weren’t very good. Thanks for this thought provoking post. I tend to buy a lot of inexpensive books for the same reason I buy the more expensive ones – because the cover and blurb caught my attention or I know of the author. I am, however, more likely to buy an inexpensive book by an unknown / new to me author than a more expensive one. What I will not do is pay the price for hardcovers – simply because I do not like reading hard covered books (too heavy to read lying down in bed for a start). I suffer and wait for the paperback release…I suspect this will be akin to torture while I am waiting for your book to be released in paperback! 1) Water, I often don’t bother with other drinks. 3) Look like they have decent action/storyline as well as actors I enjoy watching. 5) Considering I just got done reading Wool for $4.99 (Individual books are $0.99) and a few weeks before that tried reading The Host which was priced at around $9.99 at the time, nothing. I think Wool is an example of exactly what you’re asking. Something with a permanently low price point and is high quality writing. Wool is priced at the perfect point for people to pick up without denting their pocket book much. I read a CNN article a few days ago (you can find the link on Hugh Howey’s Wikipedia page) where he said he’s currently bringing in a six-figure salary as an independent author and he doesn’t have that many books on the market besides Wool. Thanks Ash. Wool is one of those phenomena that gets everyone talking about making it big as an indie author. It’s just great for Hugh Howey, and of course now he’s been snapped up by a big 6 publishing house…It’s also interesting to see how the price is differentiated between paper and electronic versions of his series. Yes, particularly as Hugh managed to retain electronic publishing rights and only gave them the print distribution. I wonder if that differentiation may be held up as an example in discussions on future pricing models. This is an important discussion to me as a reader and a writer. Whomever said that the length of enjoyment factors into the price had me nodding my head. For an e-book, I find myself looking at the number of pages before even spending 99 cents. With e-books, the number of words for a “book” can vary widely. Some shorter “novellas” seem thrown together and the stories are weak and simply a means of putting out an excerpt to sell the book-length novel they are really promoting. 99 cents seems like nothing in the scheme of things but I probably have ten 99-cent e-books that I either didn’t read or started and quit on. That adds up to $10 toward a quality book that I really wanted. I think we all just want the highest quality writing we can get for the least amount of expense. I’m not so interested in an author reissuing their back list, unless it has been fixed up in some cases, because the quality may be lesser than their current writing. It’s wonderful to see how the great writers continue to improve! A quality read is what I’m after and I’m willing to pay (more) for it. Konrath’s books may be a great read at $2.99 but that may be way too much money for a newbie author to charge. Just my two cents, or 99 cents, as the case may be. Great post and interesting comments – especially the bias they took. Why focus on price? You were really talking about BRAND. And I think that’s the crucial point – of both your post and the reality of it. Bottom line, HOW DO YOU DIFFERENTIATE YOUR BOOK FROM OTHER BOOKS? Price? No, that’s just something indies have done because that was about the only thing they could do when facing the Big Publishers, i.e. beat at the price line. Sell at 99 cents. But as many commenters pointed out here, it won’t get you very far. The latest data from Amazon proves it: the 200 best sellers in 2012 were all priced around $10 and over, only one was at 99 cents! In your case? One just needs to look around…I’m sure the idea is there waiting for you to grab it! Thanks for your comment, Claude, but no, I was talking about pricing in this post rather than branding. Brand and pricing strategy are linked, and indeed they affect each other. If you have a strong brand, your price can reflect that. If you set too low a price, it can affect the way a brand is perceived, to the detriment of sales. All authors, including indie authors, should consider their positioning in that respect. If I understand, you are differentiating your work by positioning it as a new genre rather than trying to sell by coming in at a low price point? Would you consider your brand to be ‘author of Baby Boomer novels’? For me, whilst brands are often targeted at certain market segments, the brand is something deeper than that, and as Nicola points out above, a lot of it is about trust. How do you develop that trust? On the price/brand relationship, I always remember hearing how when After Eights were launched (in the 70s?) they could have sold them for 70p (say, £3.50 today?) a box and still made a profit. But they priced them at a bit over £1 (say, over £5) and put them in those little sleeves, even though in absolute terms they might sell fewer boxes, because the market they were after was people buying them as a small present: something to take as a guest-present to a dinner party, or to offer your own guests: something which seemed mildly de luxe, rather than cheap and therefor faintly mean. I read a book on pricing psychology for my MBA. One fairly well-known effect is when people order from a wine list in a restaurant. People tend to avoid the cheapest wine because they think it will be rubbish so often the second cheapest will be the biggest seller. So clever restaurants put the biggest mark up on the second cheapest — it may be exactly the same quality (or worse) than the cheapest but people make relative judgements when they see prices. Similarly, television and electronics manufacturers will often artificially create a bottom of the range model by basically taking a mid-range model and disabling functionality that’s cheaper to build in across the range. So they spend more money on creating the cheaper version. The reason is that the bottom of the range version puts a floor under the prices of the rest of the range. They don’t care if it doesn’t sell much — its whole purpose is to justify charging higher prices for the others — on which they make more profit. The same principle may go for books, which are, of course, difficult to classify like TVs on feature. However, it’s human nature that’s been exploited by marketers for centuries, to believe that something low priced is cheap for a reason (the manipulation of this belief is why people believe they’re getting such bargains in ‘sales’).